For a bi-cultural couple, celebrating Christmas and other holidays can be liking walking through a cultural minefield. Christmas stockings, decorations and traditional foods can all provoke heated debates. If your spouse is from Switzerland, he may claim that Baby Jesus delivers presents to the good little girls and boys around the world when you know for a fact that it's a jolly man dressed in a red suit. As an American, I find it somewhat hard to believe that a tiny baby could handle the stress of landing a sleigh on a steep Parisian rooftop without bursting into tears. After all, Santa has a hard enough time maneuvering through the city traffic, and he's a robust man accustomed to managing an entire village of elves. Our family's Christmas tree has long been a cause for contention. I'll never forget the first time that I saw Stéphane running the lights up and down the tree. "What are you doing?" I demanded. Baffled as to why I was asking a question about something that was so obvious, Stéphane replied that he was stringing lights on the tree. "But that's not how you do it. The lights go around the tree. Not up and down," I said. Thinking that perhaps it was a language issue, I made large circular motions with my hands to illustrate how the lights should encompass the tree. From there, the situation disintegrated. It was our first Christmas together, I was far from my family and I wanted everything to be done exactly like it was at home. My home in the United States, not Stéphane's home in Switzerland. I'll spare you the grisly details of the ensuing fight. Suffice it to say that when we get ready to decorate our Christmas tree this year, Stéphane will hand me the lights so that I can string them around the tree. It's a job that he has completely rejected ever since I criticized the aesthetics of Swiss Christmas trees. 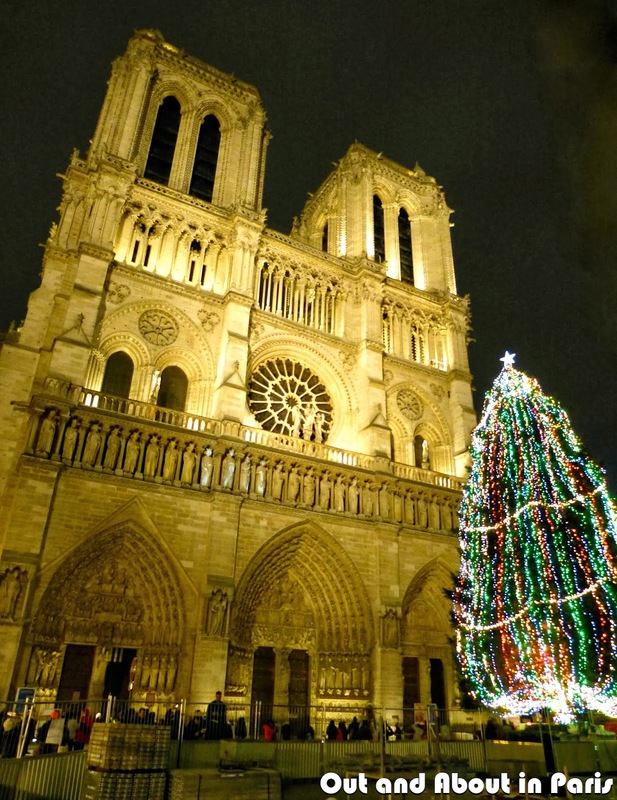 All of this explains why I was so pleased to talk with Sylvio Zago and Yoann Nedellec, the two men responsible for the magnificent Christmas tree in front of Notre-Dame Cathedral. 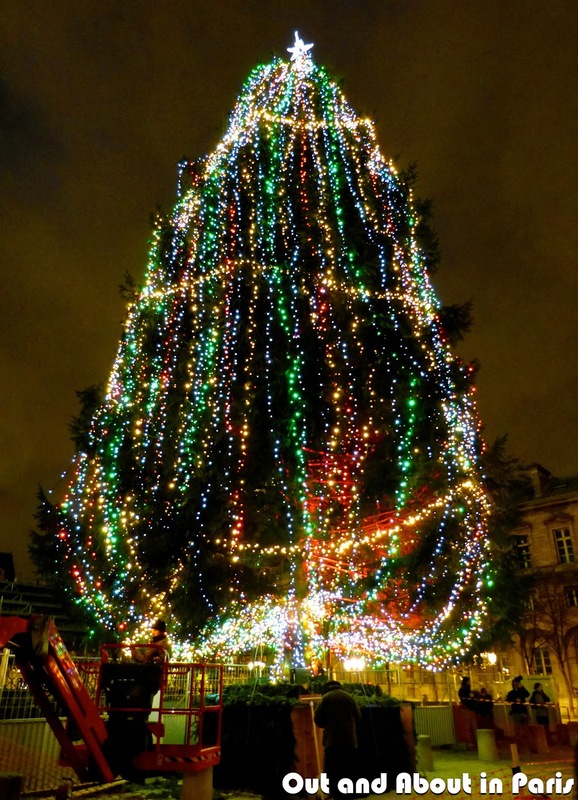 With a kindly smile on his face, Sylvio told me that the multi-colored lights running up and down the tree represent the different colors and hues of mankind. The golden lights encircling the tree symbolize unity. "With all of the trouble in the world," Sylvio said, "We need more love, tenderness and understanding." Pointing at the star at the top of the 20 meter (65 foot) tree, he declared that it symbolizes all religious beliefs, not only Christianity. When Sylvio and Yoann disappeared into the chilly night, I felt as if I had received an early Christmas gift. One of compassion. Maybe I'll ask Stéphane to string the lights going up and down on our Christmas tree this year. After all, understanding of others begins at home. 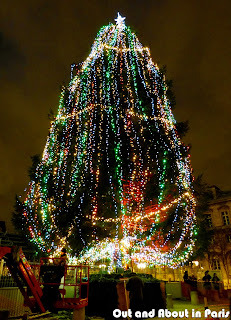 Want to see more photos of Paris at Christmastime? I've posted a lot of albums on "Out and About's" Facebook page. You don't need an account to view them. All that glitters IS gold at the Four Seasons Hotel George V! 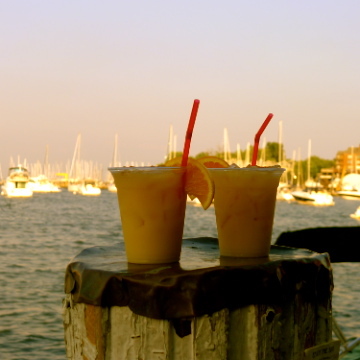 I have a feeling that combining holiday traditions is difficult for any couple! True! I guess we all have our set ideas of how to celebrate. I have never seen Christmas lights going up and down before. But anything is better than the tinsel that was once a tradition. I remember tinsel! It was always my job to put it on the tree -- strand by strand. If you go to Switzerland, you'll see lots of lights going up and down. That's the traditional way that Christmas trees are decorated there. Ooh what a lovely post. As for traditions, I completely rejected them till last year. As you say they cause so much stress and arguments. Bah humbug! Why are they so important to people? Then last year as I stood in the church of St Etienne du Mont at midnight I realsed thar the message is Peace and goodwill to all men, is the message. As for why traditions are so important, I think that it has to do with our memories. When we eat oyster stew on Christmas Eve, I remember all of the Christmases that I ate it with my grandparents and my parents. It makes me feel close to them and erases the time that has passed. Exchanging your memories for those of someone else can be hard. I'd seen lots of trees with lights going up and down, but it had never occurred to me that it was a cultural norm in some countries. 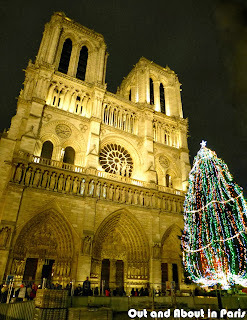 I like the symbolism of the Notre Dame tree. Funny that it had so much personal significance for you too! From the article: According to some, to light an average Christmas tree with electric lights before 1903 would have cost $2000.00 in today’s dollars. Christmas lights...??? Up and down or around the Christmas tree...? What happened to candles, real candles? You put them on the branches of the tree and they are the source of this unique glow in our living room (and on our faces)? Call me old-fashioned, but for me this is the only way to decorate our tree! One of your finest posts, MK.... and THAT'S saying a lot. You never disappoint the readers!! Now you're making me blush, Nancy! I don't like the up-and-down lights either. We were never fancy enough to have lights on our tree at home growing up though, it was always ultra tacky tinsel and a mishmash of ornaments acquired randomly over the years and end-of-year school busy work (spraypainted pinecones and so on). But the mishmash of random ornaments is the best because each one holds a special memory! They're much better than store bought ornaments. I agree with Sylvio: "We [do] need more love, tenderness and understanding." I too appreciate the symbolism of the Notre Dame tree. Please keep up the great posts. Merry Christmas Mary Kay!! Thank you, Baron, and Merry Christmas to you! I hope that your holidays are full of love, tenderness and understanding! I guess my reaction was the opposite. Initially, I adopted everything that the French did at Christmas, until I had my own children, when it suddenly all seemed more important to have my Australian traditions. As the kids got older though and stepsons joined the celebrations, it became more difficult and I have had to adapt to such an extent that I don't even feel like celebrating Christmas any more. A tradition in which all that matters are the presents is very hard to accept. Oh, Rosemary, I wouldn't feel like celebrating either if all that matters is the presents. I know what you mean about traditions becoming more important once you have children. I somehow felt it was my responsibility to connect our children with their maternal ancestors by carrying on the traditions from my childhood. All of that went out the window when we lived in the tropics!